14 years of full time trading profitably has been possible for me because of everyday focus on risk control. In 14 years there have been gang buster high triple digit years and some sub par positive year but never a negative year. And one of the key to that is playing good defense through risk control. Good risk management keeps you in the game and if you remain in game you get lot of opportunities during some periods in the market. Also if you do not have negative years compounding works in your favor as you keep on adding to your gains. In last 8 years I have been actively blogging and have interacted with hundreds of traders and seen hundreds of beginning trader give up or blowout before they even had chance to find a profitable method and master it. If you see many trading blogs that existed 8 years or 5 years or 3 years ago are dead today as the trader lost money or gave up. Many attempt this game but if they do not focus on risk management from get go they soon vanish. It is difficult to understand the importance of risk management when you are starting out. Most are excited by the prospect of how much money they can make. I use a % risk model. I risk anywhere from .25 to 4% on a trade and in rare very high conviction trade higher than 4%. . But most trades are around .25% to 1% risk. What does 1% risk means? It means how much will be the loss if my stop is hit. 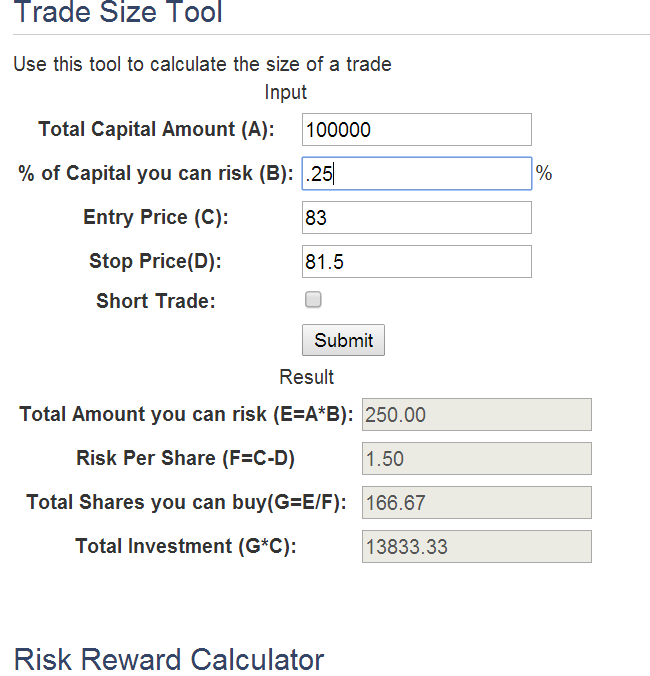 So 1% risk means if my stop is hit I will have 1% loss on total capital. It does not mean that I have 100 positions open with 1% risk. 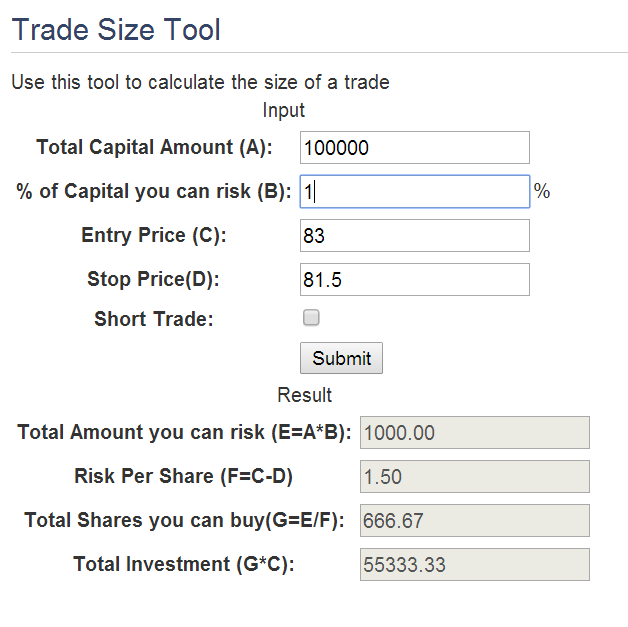 In a 100k account a 1% risk means 1000 dollar loss if I get stopped out. 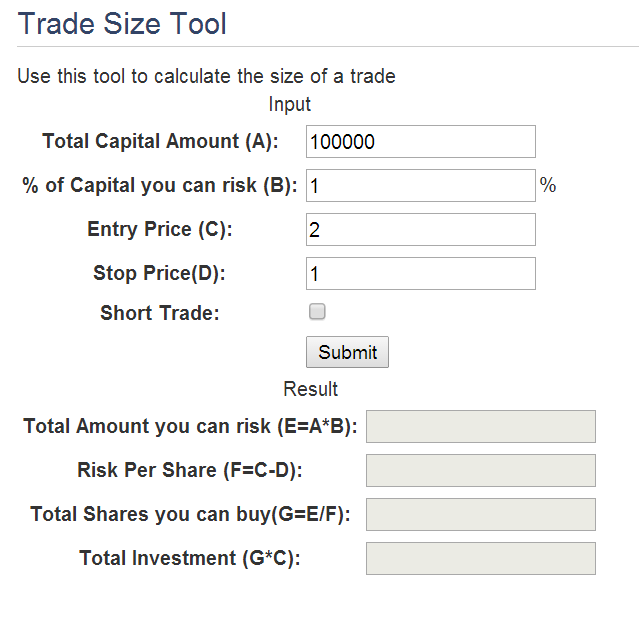 In my approach I first determine % of risk to take on a trade. So let us say if the account is 100k and if I decide to risk 1% then the amount to risk is 1000USD. 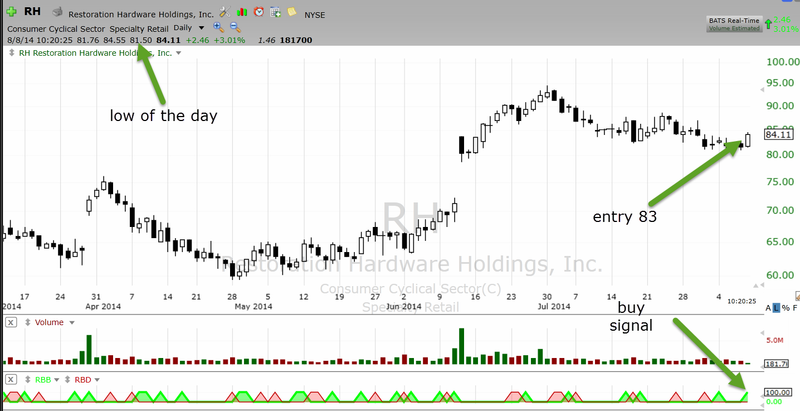 Let us say for example, I see RH in my swing trade scans today early and want to enter when it was around 83. The low of the day is 81.50 . That will be my stop. So I will buy 166 shares at 83 and stop will be at 81.5. If my stop is hit I will lose 250 dollars. 55% of account will be invested but risk will be 1%. There is a handy calculator to do this here if you want to use it. If you find a situation where the distance between stop and entry price is small then you can have a big position in a stock with just 1% risk. If you see some of the trades I do, where I had anywhere from 50% plus to 105% plus on single trade but my risk was below 1%. And more than that selecting right market conditions to trade in comes in. I avoid bad conditions to trade in and sit in cash while others get whipsawed. It took me some hard lessons to learn that. If you see my overall trades over many many trades this year there is only 1 trade where I lost .59% of equity. Overall 60% of trades are positive and because the worst loss is only .59% of equity the risk is contained . This kind of approach to risk management can help you quickly ramp up your gains under right conditions. You can also use Telechart PCF to do above calculation instead of using my calculator. That is quicker way to find how many shares to buy once a Trade Alert is issued. For that follow following steps. You can make these as columns so you can easily see the number of shares to buy next to a ticker. The risk approach above should be married with other things like market timing, situational awareness, stock selection, and your cumulative returns till date. I take smaller risk positions if market direction is uncertain. Similarly I risk less when market is in extreme zone and has higher probability of reversal. Same way not every idea is worth risking 2% or 5%. So very few trades have that kind of risk. There is also phasing of risk. Once you are up 30% plus in first few months your risk strategy can either protect that profit or use that profit buffer to go for a kill. These are all variables which are under your own control and you have to use them based on situation. A well thought out risk management strategy will keep you in the game and make you millions.